Everyone is welcome on rides facilitated by SPBC; membership is not required. Of course, we hope that after you ride with us you will want to join and help keep the club rolling! With limited exception, all of these rides are "Show and Go." Unless otherwise noted, they start at 8:30 AM in the south parking lot of North Shore Pool Map. Check our Facebook group for the latest updates. Helmets are required for all riders and use of tri-bars are prohibited within the group. Follow traffic laws and use established group riding techniques. If you are unfamiliar with group techniques, please ride to the rear and observe. Review group riding techniques here and how we ride here. Safety is everyone's priority and you may be asked to leave the group if you exhibit unsafe habits. Be aware that cycling is a dangerous sport. You ride at your own risk. The St. Petersburg Bicycle Club’s largest rides are on Saturday mornings, and they offer the most variety for speed, route and distance. For these reasons we recommend your first ride with the club be a Saturday ride. Beginning at 8:30 AM, our rides are called out from fastest (24+ mph) to under 16 mph. From the approximately the fall time change to Memorial Day, rides begin at 8:30 and 8:00 AM during the summer months. The Saturday and Holiday Rides are the only official club rides described on this page. The rest are user initiated and we list them here only as a courtesy to the cycling community. Along with the ride speed, we call North rides and South rides. (Lately, everyone is going north.) This is the general direction the ride will travel; the number is the speed. For example, “22 South” ride will travel South from the Pool to Pinellas Point and back at around 22 mph. A “22 North” ride will travel North from the Pool to Weedon Island at around 22 mph, etc. The speed is cruising speed, not what you might see as average speed after the ride is over. Speeds should not materially exceed the stated speed for extended periods. The North and South routes are each about 20-25 miles round trip. Occasionally, some riders go to Ft. De Soto, which is about 45 miles round trip at a speed predetermined by those present. At slower speeds, there is a no-drop policy. If you fall behind, the group will wait. If you tire on the faster rides, there will be another ride behind at a slower pace you can join. Some rides are social rides with a premium on fun. If you’re a new rider, let the ride caller know. The caller can help you find the group best suited for your interests. The rides are listed as a courtesy only and may not always be active. Use the contact page or check the club Facebook group for updates. 8:30 AM: USF to Ft. De Soto @ 26-30+ mph. 8:30 AM: St. Petersburg Main Library, 3745 9th Ave N. (Map). 7:30 AM: Lemony Fresh San Antonio Hills. About 43 miles. Check Event Calendar for schedule, as these are irregularly scheduled. 7:30 AM: Pinellas Trail in Seminole at 102nd Ave N. Steady 20-22 mph ride along Gulf Blvd out to Pass-A-Grille and back. Breakfast stop is generally Darryl and Sharon's Park Street Grill at about 9:30 a.m.
7:30 AM: Paciugo (300 Beach Dr.) to Pass-A-Grille via Pinellas Point & the Pinellas Bayway @ 20-22 mph. Meets Seminole-based ride along Gulf Blvd. and then heads north on Gulf Blvd. to Park Rd. Bridge with sprints. The along the Pinellas Trail to brunch. About 40+ miles. 7:00 AM: USF for one loop backwards of the South route (17 miles). Pace 18-21 mph. 8:00 AM: The above 7:00 AM ride returns to USF to meet other riders for a trip to Pass-A-Grille @ 20-28 mph. About 30 miles. These rides take the "standard" South route: 4th St. South to Pinellas Point, then North on 31st through Lakewood’s St. Petersburg CC golf course before turning North for home on 6th street. 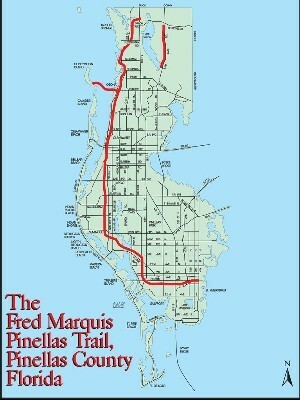 This loop is about 17 miles with three optional sprint points on Pinellas Point, at the end of the golf course and past “Thrill Hill” coming home. The 8:00 AM start is from USF (Map). This ride can have up to 50 riders on any given day. A partial second loop follows at a faster pace for another 9 miles. Occasionally some riders go to Pass-A-Grille for total of 30 miles. On Mon., Weds. & Thurs. the 1st lap pace is 19-21 MPH. On Tue. & Fri. the 1st lap pace is 17-19 MPH. All rides are “Show and Go”. Check our Facebook group for the latest updates. Tuesday & Thursday 7:00 AM: North Shore Pool to Pass-A-Grille & Ft. De Soto @ 20-26 mph. About 45 miles. Some riders may return from Pass-A-Grille and meet the second loop of the 8 am weekday ride below. Tuesday & Thursday 5:00 PM (4pm during winter months): USF to Ft. De Soto @ 24-30+ mph. Tuesday (temporarily moved from Wed) 8:30 AM (time varies depending on time of year): Seminole City Park & Pinellas Trail (Map) to Belleair, over three bridges through Clearwater to Dunedin @ 15-18 mph, about 35 miles. Brunch & return via trail. Thursday 10:00 AM: Billy’s Stone Crab Seafood & Steak (1 Collany Rd) on Tierra Verde, around Fort De Soto @15-20 mph, about 20 miles. Lunch. All holiday rides start at North Shore Pool. Riders take off riding sharp at 8:30 AM. All rides are free, and the public is welcome. Specifics are posted a few days in advance on our Facebook group. St Pete Bicycle & Fitness has various rides listed on their Facebook Events page. Follow this link: http://synthetictransport.com/vamp-rides/ to find suggestions compiled by Kent Polk for longer rides. Tampa Bay Weekly Rides. Provided by Brian Clarke on Google Docs.